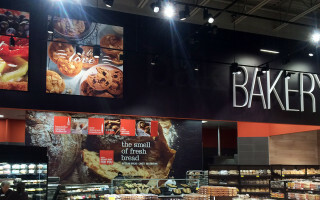 Sign Here has produced custom signage and décor for various grocery stores including aisle markers, wall graphics, and department lettering (bakery, produce, meat, seafood, books/magazines, frozen food, wine, and dairy). We also design and fabricate plaques, wall murals, product logos mounted on foam core, wallpaper, trellises and awnings. We have produced signage and décor for grocery stores throughout New England and the Eastern Seaboard to Florida.